FastBlast Review - Can It Help You Lose Weight? FastBlast brand smoothies and supplements are designed to make intermittent fasting easier by giving you a nutritious, satiating option for your fast days that won’t hinder your weight loss efforts. FastBlast Review: Can It Help You Lose Weight? FastBlast is a brand of wellness products that are designed to help you lose weight through intermittent fasting. At the time of writing, the company offered two products: a fasting drink (FastBlast Smoothie), and a daily supplement powder (FastBlast Daily). The brand got its start when its founder, William King, experienced a catastrophic skiing accident that left him disenchanted with the options western medicine provided for healing. The accident inspired a decades-long pursuit of holistic wellness to learn what it would take to restore his health naturally. The result? A passion for learning about communities that had long average life expectancies and minimal risk of chronic disease, and the creation of the FastBlast product line to help American consumers achieve their best health through fasting. That all sounds impressive, but is it possible for a smoothie brand to live up to this origin story? Let’s look at the facts behind intermittent fasting to see what FastBlast offers to help you decide whether this is right for you. According to Healthline, Precision Nutrition, and an article we recently published, intermittent fasting is the process of priming your body to burn as much fat as possible by temporarily depriving it of calories (especially carbohydrates). This puts your system into ketosis, or an optimized metabolic state where you burn body fat for fuel instead of glucose. Intermittent fasts can vary significantly in style and duration, but one popular method is to eat as usual for most of the week while fasting or considerably reducing your calorie consumption for two days out of seven. These short bouts of fasting, the theory goes, successfully help you burn fat without slowing down your metabolism. There’s no denying that intermittent fasting’s benefits are impressive, but will FastBlast help you achieve them? The best way to find out is to look at what the brand offers you. What are the Promised Benefits of FastBlast? According to the company website, the FastBlast line of products offers many benefits for achieving optimal weight loss. They claim that their program is one of the healthiest ways to lose fat quickly because you won’t wreck your metabolism by excessively depriving it. Instead, they state that the program allows your digestive system to rest so that your body can put more energy towards burning fat, improving mental functioning, and even promoting relaxation. Flexibility with Timing: You can choose which days of the week you use FastBlast products and eat as usual the rest of the time. 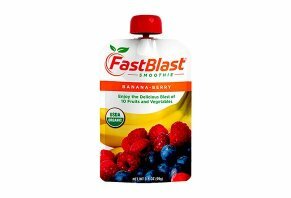 Convenient Smoothies: FastBlast smoothies come in pre-portion squeeze pouches that are convenient for travel and don’t take any prep time to prepare. Filling and Satisfying: The company claims that FastBlast smoothies are formulated to control your appetite and leave you feeling full (more on this later). Helps You Maintain Energy: FastBlast tells us their smoothies contain quality fruits and vegetables to fuel your cells for slow energy release. That’s a lot of praise for the FastBlast plan, but what does this wellness strategy entail? Let’s look at the details. According to the product website, the FastBlast weight loss plan begins when you determine what your target weight goal will be. Then, you choose two days of the week (consecutive or non-consecutive is okay) to replace regular meals with FastBlast smoothies and eat smart for the other five days of the week. For best results, the brand recommends not scheduling your fasting for days when you need to attend business or social functions that involve meals. On your fast days, replace all snacks, meals, and drinks besides water with FastBlast smoothies. They recommend taking one smoothie every two to three hours so that you take six per day, drinking a glass of water with each one to better suppress cravings. If you’re used to starting your day with caffeine, one cup of black coffee or green tea is permitted, so long as you don’t fill it with cream and sweeteners. After a fast day, the brand suggests you eat small, simple meals so that you don’t strain your system with the digestive process. The website states that you can continue this plan until you achieve your goal weight. From there, you will transition to the ‘Optimal Health Plan’ where you cut your FastBlast smoothie consumption down to one day a week. According to their website, you should keep up this routine for as long as you want to maintain your weight loss. Can You Exercise While on FastBlast? At the time of writing, FastBlast’s website states that they encourage you to exercise while on the plan, though it’s smart to take it physically easy during your first fast. This is because your body doesn’t need freshly-eaten food to fuel itself during a workout, but instead will rely on your body fat for energy. Is the FastBlast Safe for Diabetics? FastBlast tells us that each smoothie contains a blend of carbohydrates, protein, fat, and fiber without any added sugar. This can restrict insulin production for people with diabetes and potentially lead to health problems. For this reason, the brand strongly recommends talking with your doctor if you have blood sugar concerns before beginning the diet. What Products are Available Through FastBlast? At the time of writing, FastBlast offers two products: FastBlast Smoothies and FastBlast Daily, a foundational nutritional supplement. The FastBlast smoothie comes in a banana-berry flavor, and the brand claims that it can provide you with well-balanced nutrition through a blend of protein, carbohydrates, and healthy fats to curb cravings while on an intermittent fast. This daily supplement is a concentrated whole-food powder that is formulated with organic, plant-based foods (many which are fermented), The brand considers it to be the ideal way to support your fasting efforts every day of the week because it curbs cravings for sugary foods. What Ingredients are in FastBlast Products? Both FastBlast products contain different ingredients, so we’ll investigate them separately. We found on the product website that the FastBlast Smoothie contains a fermented blend of blueberry, carrot, cranberry, apple, broccoli, parsley, spinach, kale, banana, and raspberry. Each smoothie also includes organic coconut cream, pea protein, and lemon juice to keep you full and sustain your electrolyte levels through each fast (without turning to extra calories). These ingredients all sound healthy, but will any of them help you lose weight? Research on numerous articles on Nutrition Facts showed us that the fruits and vegetables included in FastBlast are nutritious and should be part of a well-balanced diet. However, from what we found there isn’t necessarily evidence that they can improve your metabolism during a fast. Organic coconut and pea protein might be the exception. Healthline tells us that the medium chain fatty acids contained in coconut oil are sent to the liver, where your system converts them into energy right away. This puts you into ketosis (a fat-burning mode) faster during a fast. Likewise, a study published in Nutrition Journal shows that pea protein might improve feelings of satiation between meals. However, it’s unclear how much of both of these ingredients are contained within the smoothie, and whether they are concentrated enough to provide these benefits for weight loss. From our research, it seems that the primary weight loss benefit from FastBlast smoothies is the calorie deficit that you put your body in. Each smoothie contains 110 calories, meaning that you will consume 660 per fast day if you follow the plan correctly, or roughly a third of your normal level. Healthline states that a pound of fat is approximately 3,500 calories, so regular fast days can lead to weight loss if you don’t overcompensate during the rest of the week. Put simply, while the ingredients in the smoothie all seem to have health benefits, they don’t have any exceptional abilities to speed up your metabolism or promote faster weight loss. For these reasons, it’s hard to claim that taking FastBlast smoothies will provide you with much additional benefit for your fasting compared to any other plant-based smoothie drink. Regarding FastBlast Daily – The company website tells us that each scoop of FastBlast Daily contains the probiotic content of a full serving of yogurt, and many fermented fruits, vegetables, and herbs. These include oat beta-glucans, broccoli, spinach, kale, parsley, carrots, blueberry, cranberry, apple, cocoa, ashwagandha, ginger, beetroot, turmeric, green tea, Panax ginseng, spirulina, chlorella, tulsi, reishi mushroom, cordyceps mushroom, goji berry, acai, pomegranate, acerola cherry, black currant, maca root, and green cabbage. On the ingredients list, these compounds are all listed together as a proprietary “Superfood Blend” that comes to about six grams per serving. Because many nutritional compound’s health benefits are directly correlated to their concentration, we can’t speak to the effectiveness of the ingredients within this blend. Making up the minority of the weight for each serving are two other proprietary blends, the Enzyme Blend, and Probiotic Blend. Together, they equal 25 mg (.25 grams). How Can You Purchase FastBlast Products? From our research, the best way to buy FastBlast is through the company website. Amazon also sells the smoothie, but they were out of stock when this article was published. We found that the company website sells their smoothies in three sizes: one box for $54.95, two boxes for $99.95, and four boxes for $179.95 (plus shipping for each size). Each box contains twelve smoothie pouches, or enough for two days (one week) of intermittent fasting. The company also offers an option to “subscribe and save” and sign up for monthly deliveries for each box size for $49.95, $89.95, and $149.95, consecutively. The price structure for FastBlast Daily is similar. You can buy one can, two cans, four cans and six cans for a one-time price of $29.95, $54.95, $99.95, and $134.95. Also noteworthy, there is no shipping charge when Daily is purchased with FastBlast Smoothies. Does The Company Offer a Guarantee? We noted on the company website that FastBlast offers a risk-free 60-day money back guarantee on all purchases. In their words, you can “test drive” FastBlast products for two months, and if you have any dissatisfaction, you can request a full refund of your purchases. What Do Customers Think of FastBlast? At the time of writing, FastBlast has a relatively small online footprint. We weren’t able to find any personal reviews of the products from bloggers, though we did find reviews on Amazon and Facebook. On Amazon, FastBlast smoothies average three stars after 45 reviews. Some users commented that the plan helped them lose weight (about three pounds a week) and that they didn’t feel hungry during the two-day fasts. One reviewer mentioned that she loved the convenience of stowing smoothies in her bag during the day, and noted that they kept her sustained and full of energy. Others weren’t as positive. One reviewer noted that the smoothies weren’t filling and that it was a major struggle for her to stick to the program. While she lost three pounds, she attributed that to the calorie restrictions, not specific components of the smoothies. Other reviewers mentioned that they liked the smoothie taste but wouldn’t be repurchasing because of how expensive they were. Drinking six smoothies per fast comes to $25 a day, which many reviewers thought was too expensive for what they got. Facebook reviews average almost ten out of ten stars, but some users commented that the smoothies didn’t seem to have any special ingredients besides fruits and vegetables and that they considered them to be a rip-off for the amount of product they got. What Products are Similar to FastBlast? While FastBlast promotes itself as the only smoothie brand explicitly designed for intermittent fasting, there are dozens of other drink-based diet aids on the market today. Two we thought were worth comparing to FastBlast include SlimFast and Orgain Organic Nutritional Shake. SlimFast is a meal supplement drink designed to help you shed pounds. Unlike FastBlast, you are supposed to take SlimFast shakes daily as a meal replacement product. SlimFast also has a more extensive product line, and each shake averages about $.50 to $1.50 per serving (compared to over $4 each for FastBlast smoothies). SlimFast products also come in a greater variety of flavors, though many dieters still consider them to be limiting because they are expected to consume them every day. Another difference from FastBlast is that SlimFast products tend to include a higher number of added sugars and artificial ingredients. One shake brand that matches FastBlast’s commitment to healthy ingredients is Orgain Organic Nutritional Shakes. These weight loss drinks contain milk proteins from grass-fed cows, and organic fruits and vegetables. Dieters are expected to use the shakes to replace their meals (not for a full-day fast), and twelve shakes come to $35 on the brand’s website (FastBlast comes to $50 for the same amount). So what should your strategy be if you’re looking to lose weight? If you’re looking to experiment with intermittent fasting, a satiating, low-calorie smoothie like FastBlast might make sense. However, the standard method of fasting requires you to not take in anything but water during the fasting period. For this reason, it’s important to remember that you might not need an outside product to get your body into ketosis effectively. Our View: Does it Make Sense to Fast with FastBlast Smoothies? Finding a weight loss strategy that makes sense for you isn’t easy, and FastBlast seems to offer an appealing option. The brand promises to make fasting easier and improve the efficiency of your fasting time by keeping you satiated without excessive calories. Does it live up to its claims? While we haven’t tried this product ourselves, our research shows us that the brand’s smoothie and supplement products contain a large number of plant-based ingredients that are renowned for their nutritional qualities. Our research showed that while these ingredients are healthy, they don’t necessarily have qualities that make them well suited for weight loss through fasting. Pea protein and coconut fiber proved to be the exceptions, as these ingredients tend to improve satiety and trigger your liver to burn more fat. Will FastBlast make your intermittent fast more effective for weight loss? Frankly, the evidence doesn’t seem overly convincing. While you are likely to lose weight on the FastBlast plan, it will mostly be the result of lower calorie consumption. Overall reviews online about FastBlast smoothie’s abilities to improve your fasting experience are mixed. Some people found them more satiating than others, but almost everyone agreed that the plan was quite expensive for the amount of product that they got ($25 per day, or $50 per week of fasting). If you want to learn more about the benefits of intermittent fasting (with or without FastBlast’s help), we recommend checking out our article on the topic. It should answer most of your questions. Write a Review for FastBlast!